Sorry for not updating the blog in 2 weeks. I was busy as hell. What happend? We played two small local tournaments, Katja cashed in both (3rd and 4th as I remember) and some cashgames where we also won both. Then it was time for the “Hamburger Herbstmeisterschaften” in Spielbank Hamburg. I hardly can remember that one. Both Katja and I started good, made some chips on day1, played some cash games and won there also, Katja in the pot limit holdem and I in the pot limit omaha (my new game of choice). In the tournament I got very lucky one time (in a small pot) when I had “Tommy” from Denmark all-in (for a fraction of my stack) on a Q-T-3 flop. I had only played crab by rasing in early position with Q-9, got a call from Tommy and made a pot sized bet on that flop. Heads-up, he came over the top and I could not lay it down so I called (I had lots of chips). I turned over my Q-9 but he had Q-T for top two pair! Well, I was in the zone and joked with him that I will still beat him in that pot and that he should get his money out to do a rebuy. I must be said that Tommy is a great player and I like the guy. We had lots of fun there and he had this “talk-as-much-as-you-like, you-still-dont-get-me-here” smile but the turn of a J changed that instantly. Now I had the opened ended straight draw and he was not smiling that much anymore. The 8 on the river made my straight and I almost fell out of my chair, laughing. He took it good and made some funny remarks while taking his rebuy. I got moved soon and lost A-Q vs. KK, all-in preflop so I am out of the tourney in 25th place from 60 and of to the cashgames (Omaha again). Katja did better until there have been only 13 players left (9 ITM). She went all-in on the button with T-T, got a call from friend/foe “Chappi” Peymann holding Q-8 (not that he had a lot of chips but the blind was 8k already and Katja had only 23k to raise). Flop came J-9-2 but the Ten on the turn gave him a straight and she could not fill up on the river so she was out also. I handed Katja my money and went home, tired. Katja played until the wee hours and came home with a nice cash game win so the weeked was still a success for us. Tuesday we went to dinner with Sebastian “Luckbox” Ruthenberg, winner of the German Open (played and filmed in London by partypoker) before playing a small live tourney again, no money finish for us this time, but again a small score in the cashgames. In fact I played the holdem pot limit but Katja made much more playing the 10-20 limit game. Congratulations to Sebastian for continuing his lucky year with this 50,000 Euro win. The guy is unbelievable lucky good and successfull this year. Congratulations one more time! Here is (german) press release. Wednesday we left to Dublin. PokerStars held a welcome party, Greg Raymer and Chris Moneymaker have been there so the media attention was huge (again). More than 70 accredited media persons! Katja had drawn playing day “1A”. She had a roller coaster ride but ended the day with 40k in chips, the average being 36k. Well done! Between my reports for the german pokerstars blog I played a No Limit Holdem Cashgame. I did poor at first but then won some hands and made a nice score. 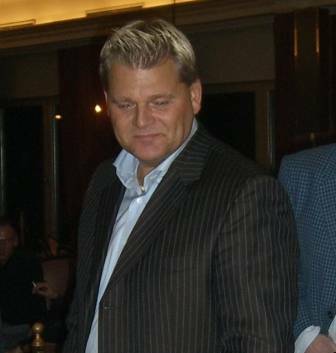 Later that night I moved to a PLO game with some experts (such as Arthur Rabie and Marcel Luske) where I gave some back. Next day was “off” for her, only 4 interviews and 2 TV-recordings. I was on duty reporting about the tournament and playing some more cashgames. Saturday was Day 2 for Katja and bought myself into a €500 NLH event as 230 others did also. We both did poorly. Katja played 3 hours but finally busted out in ~63th place (32 paid). Not bad but still, no money. 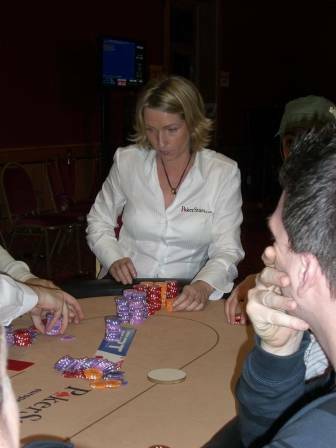 Katja reached the second day in 3 out of 4 EPT events this year but failed all three times to get into the money. 2 bad plays and also some bad luck. Still, she is in such good shape mentally and continues to improve her game daily that she in absolutly good position to get there soon. Sunday’s €300 tournament proved this. While the EPT final table took place (with the very good Roland De Woolfe winning 550k) 208 players entered that tournament. Katja doubled up in the very first hand with Q-Q against a scandinavian blufffer to her left and it was no looking back then until the final table for her. The bluffer got replaced by – Greg Raymer. Two Team PokerStars players on the table in seats 8 and 9, chatting and talking the whole time, the media loved it. I myself was in seat 2 of table 1 and guess who was on my left after about an hour? Yes, Chris Moneymaker. So, we both had our own world-champions with position on us. This keept up for like 2 hours before I took almost all of Chris chips holding T-T vs. his A-Q, all-in preflop. Q on the flop but T on the turn. I moved on to ~30th place (18 ITM) when I ran shorthanded into A-A 🙁 Katja did much better, reaching the final table with chips. Still, the made her first costly mistake during the whole tourney there by min-raising with A-J on the button and laying it down to an “all-in” from the small blind (my opinion) and then lost a race for all of her chips with T-T vs. A-K in the BB. 9th place, good result, still she was very disappointed and we talked long about that A-J hand. Since yesterday afternoon we are back in Hamburg. Katja has a day “off” today again (only one phone interview 😉 and a small tournemant tonight; tomorrow she leaves to Munich to comment on some poker stuff for DSF. Oh, and Katja got selected as “poker babe” of the month :D. As you might know by now, her (german) blog is “blog of the month” at pokerolymp.de.